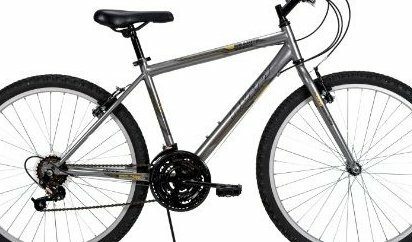 Men's five-speed comfort bike; has precision-crafted steel hard-tail frame with front suspension. 26-inch wheels; linear-pull brakes; derailleur gears; alloy rims; one-piece crank; RSS fork; front-load stem. Kraton handlebar grips; quick-release seat; knobby tires for greater traction. Recommended for ages 12 years old and up. Huffy products generally include a limited lifetime frame warranty.